Followed last week’s conflagration in Ardoyne over an enforced Orange parade, Bobby Storey and the anonymous youth stood face-to-face amid the debris of days of rioting by nationalist youths. Accounts of the exchange vary. In one version, Storey scolded the young man, telling him “you’re hiding behind a mask”. “lt’s absolutely ridiculous, giving the wrong face of this district. It’s a proud district and a good district,it’s an absolute disgrace”, he says. Storey served 18 years in prison for his role in the armed campaign and has been described as one of the IRA’s most powerful figures. However, the young man, who stands just inches away from Storey, was defiant. “Sure, you sold out your community,” he responded. “Just so that the likes of Gerry Adams and Martin McGuinness could parade about in posh suits and sit up in Stormont. What do they care about the Ardoyne now? It emphasised a deterioration in relations between Sinn Fein and a generation of young working class nationalists who sought to take matters into their own hands last week. The trouble began during the July 12th marches by the Orange Order, when an Ardoyne residents group marginalised by Sinn Fein and others as ‘dissidents’ organised a sit-down protest. Members of the Greater Ardoyne Residents Coalition (GARC) clung to each other before the PSNI riot police and in the path of the Orange feeder parade, holding placards with the words ‘Residents not Dissidents’, and wearing t-shirts carrying the simple message: ‘Peaceful Protest’. Nevertheless, while hundreds of local youths watched, they were dragged and beaten off the street by the PSNI. Belfast quickly erupted into intense rioting at levels not seen in over a decade. The war on the street continued for three nights despite waves of condemnation in the media, much if it from Sinn Fein. 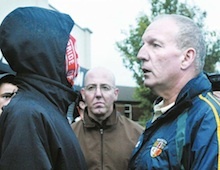 However, not even the presence on the ground of IRA veterans Gerry Kelly and Bobby Storey failed to quell the rioting. Instead, it spread across the North, with serious disturbances on the streets of Derry, Lurgan and Armagh. Republican Sinn Fein even suggested ‘the Provisionals’ were collaborating with the PSNI by identifying some of those who were involved in the protest. It said two of its members had been arrested in north Belfast and interrogated. “The question must be asked were their names and details handed in by members of Provisional Sinn Fein who were out taking details at the protest against sectarian marches on Monday,” they asked. Gerry Kelly attended a counter-protest in the Ardoyne on Thursday night which called for an end to the violence. He blamed “a number of small factions”, including GARC and the Republican Network for Unity (RNU) for moving onto the road four hours before the parade was due. “All that was achieved by this was that it undermined local residents and prevented them holding their planned protest,” he said. He claimed that many of those involved were not even from the area. The North’s Deputy First Minister Martin McGuinness also hit out at the protestors. In an address to the MacGill Summer School in Donegal, Mr McGuinness said there were “a small number of individuals” who “cannot grasp the political realities of modern-day Ireland”. “They can be found in the unrepresentative militarist factions who continue to carry out armed actions and the criminal elements who operate under the cover of bogus patriots. The RNU commended those who protested against the Orange parade but “rejected” an anti-social element who it said had engaged in vandalism and the stealing of cars. Belfast chairperson of the RNU, Carl Reilly, said the PSNI had shown a “complete disregard” for the rights of the people of Ardoyne by attacking a peaceful protest. “RNU commends the dignity displayed by Ardoyne residents who held a successful sit-down protest against the triumphalist march forced through their community on the Twelfth. “Despite, taunts, beatings and brutal arrests witnessed by local people, political activists and of course the media, the protesters remained dignified throughout, even though surrounded by police dogs and several hundred RUC/PSNI members. “The protesters were exhausted, staving off constant rough attempts to remove them from the road, but their determination to prevent the march from going through Ardoyne shone through. It took several hours to remove the demonstrators in full view of national and international media. “At 7.25pm, RUC/PSNI storm troopers made their first totally unprovoked charge at the supporters present. Despite people telling PSNI members that this was a peaceful protest, they charged again at 7.45pm, during which women were assaulted with batons. The PSNI has said that 200 “suspects” are still being “hunted” by detectives investigating the riots. Meanwhile, the breakaway Oglaigh na hEireann (IRA) has claimed responsibility for a bomb that blew a huge crater in the road in south Armagh last week. Oglaigh na hEireann said it was behind the 500lb landmine abandoned between Belleeks and Cullyhanna. The same group also said it was responsible for a coffee-jar bomb which failed to explode in north Belfast earlier this week.